Tao Yu took the snap in pistol formation and scampered left four yards into the end zone and into history. With that score, Tao became the first Chinese quarterback to play and also score a touchdown on the debut weekend of the China Arena Football League. Tao’s TD came during his Shenzhen Naja club’s 47-19 throttling of the Dalian Dragon Kings on Saturday at the LeSports Center in Beijing before a National Day crowd of 11,500. 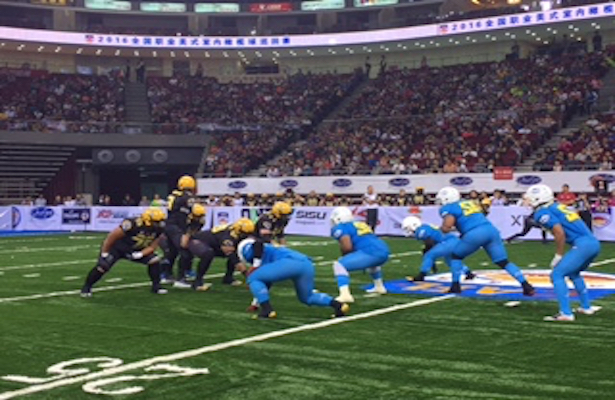 Other Chinese-player firsts included the first kickoff, by Chao Ran Li of the Qingdao Clipper, who ended up tackling an American player on the return. Qingdao wide receiver Tian Chu Zhang scored the first CAFL touchdown by a Chinese player and finished with four catches on the day. The Qingdao Clipper held off a last-minute surge by the Guangzhou Power to preserve a 38-35 win. In the Sunday game, the Beijing Lions bested their big-city rivals the Shanghai Skywalkers, 54-53, in a thriller in the league’s first overtime game.